THIS IF FOR THE PDF VERSION, comes to you in your email immediately after payment. FIND THE PAPERBACK VERSION HERE. Simplifying your scheme to get your defense to play fast and aggressive! Eight Laces Consulting is proud to partner with one of Southern California’s best defensive minds in Coach Vinny Fazio. Some of the chapters are: Core Values, Base Alignment, Blitz Package, Coverage Package, chapters about each of the positions, and everything else you need to understand this 3-5 system. 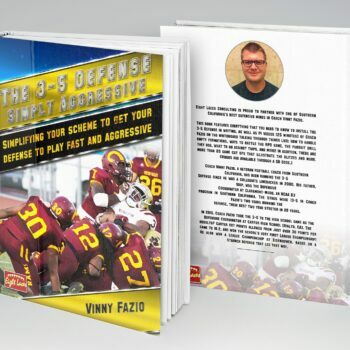 Coach Vinny Fazio (follow him on Twitter), a veteran football coach from Southern California, has been running the 3-5 Defense since he was a collegiate linebacker in 2000. His father, Skip, was the Defensive Coordinator at Claremont-Mudd, an NCAA D3 program in Southern California. The Stags were 13-5 in Coach Fazio’s two years running the defense, their best two year stretch in 20 years. Skip took over as the Defensive Coordinator at the University of Redlands (Redlands, CA) in 2005 and son Vince joined him in 2006. The year before Skip took over (2004), the Bulldogs finished dead last in the Southern California Intercollegiate Athletic Conference (SCIAC) in Total Defense and sixth out of seven in Scoring Defense. In 2005, Redlands finished third in the conference in Total Defense. In 2006 and 2007 they finished first in the conference in Total Defense; from sixth to first in just two seasons; thanks to the 3-5 Defense. In 2010, Coach Fazio took the 3-5 to the high school game as the Defensive Coordinator at Carter High School (Rialto, CA). The results? Carter cut points allowed from just over 30 points per game to 10.2, and won the school’s very first League Championship! He also won a League Championship at Eisenhower, based on a staunch defense that led that way.